We rented a cabin and stayed with a bunch of friends, which I highly recommend doing, because it’s way cheeper than a hotel and you can be as rowdy as you like. And of course, save money by cooking. We drove up late Thursday night, an adventure in itself as we almost ran out of gas in the middle of nowhere, Upper Peninsula, Michigan. (Two girls, mini-roadtrip, interesting northern hicks that want us to stay the night at their place…) Regardless, we made it safe, and got in three solid days of climbing and snowshoeing. On Friday morning Bryan, Michelle, Majka and I wandered out to Dairyland to set up some anchors, and get some climbing in. (Yay 3 ladies and 1 dude!) Dairyland is typically a WI 5, but it wasn’t quite touching the ice shelf/ground so the sustained climbing wasn’t as long as I’m assuming it normally is. Either way, it was a hard climb for my first of the season. 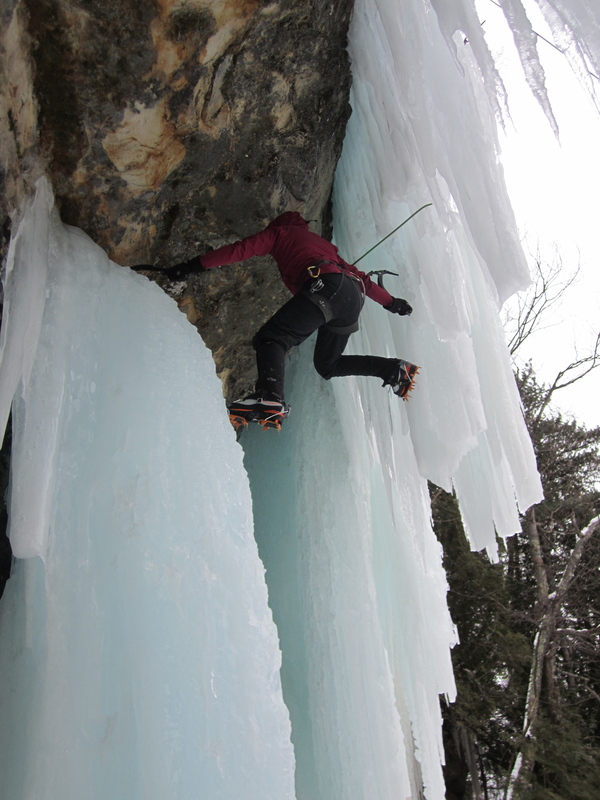 I was the first one the ice, had to pull myself up out of a cave (yea… kinda fell down further than I intended and I HATE being lowered), and it was a pretty darn pumpy overhang. Michelle climbed the route to my left and its always fun to have a buddy 30 some feet away. Soon thereafter, a few other folks met up with us, and we ended up setting up another climb nearby. (After some hiking…. and turning around… and hiking some more.) The Unnamed? route was probably a WI 3+/4. 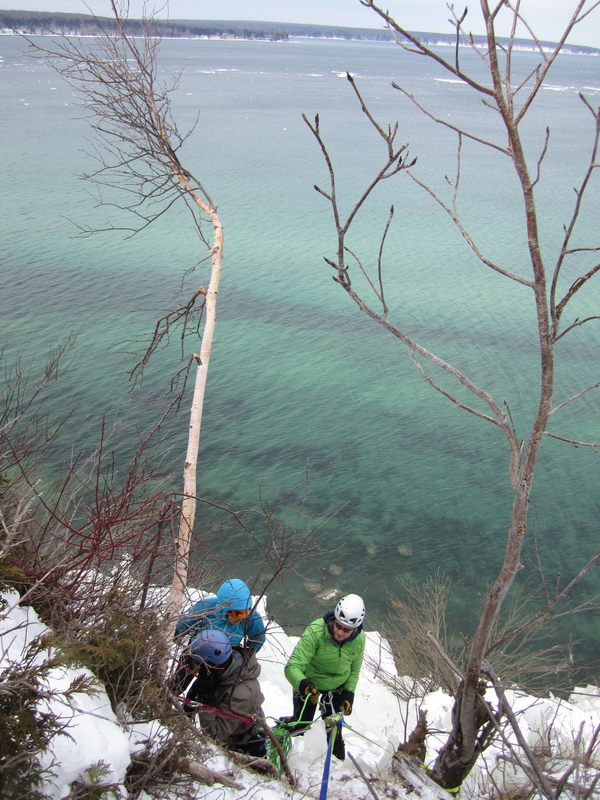 We were able to rappel to the bottom on this climb, and thats always a jolly good time. The route was also so great, that we decided to set two lines up on it the next day. Saturday morning we tried to take a ‘shortcut’ to our unnamed climb and ended up snowshoeing way out of our way, bushwhacking, and backtracking. (General rule of thumb= stay on trail.) Thanks GPS. Our crew that day was 6, and then 5 more met us… so it was a little nuts. Ended up doing laps that day, but it was still super fun. And thanks to Eddie and a static line, we have some pretty baller photos. That night we scrambled to get to the presentations at Sydneys. Sadly, we missed Majka Burhardt’s slideshow, but we were in time for Steve House‘s. 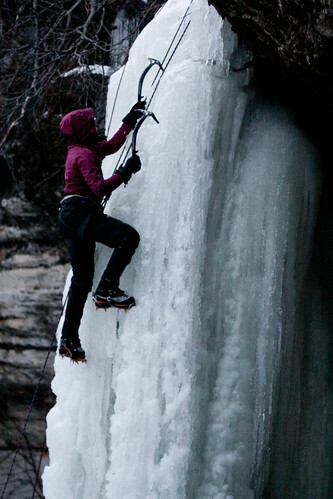 It’s really cool to go to these events and hear about so many accomplished climbers. 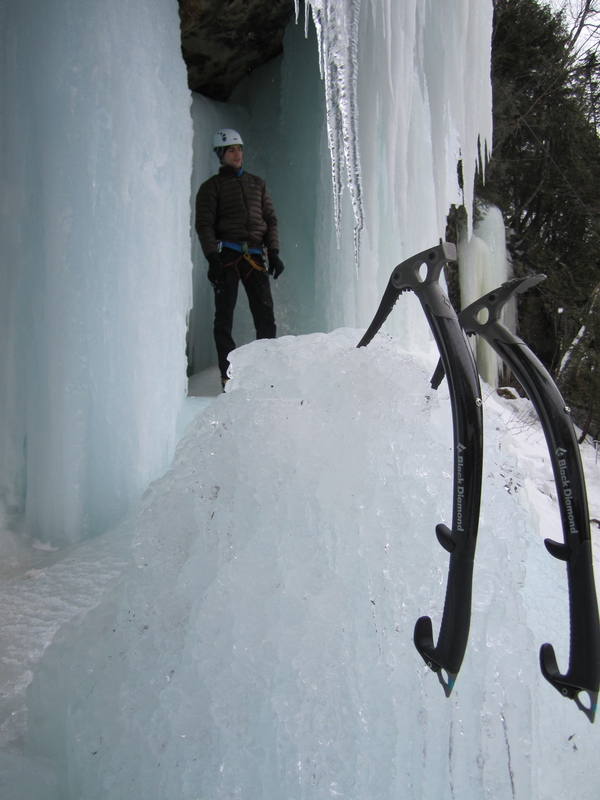 For those of you that havent been to Ice Fest, there are presentations Friday and Saturday night, gear rentals on saturday and sunday mornings for newbies, and a gear raffle on saturday night. Our last day in Munising was Sunday so we decided to take it easy and play on the curtains. This is probably the most popular area to climb, because it is very close to the parking lot, not very tall, and you can do a walk up to set top ropes. Per normal, we did some goofing around, leading, and pulling some crazy overhangs. 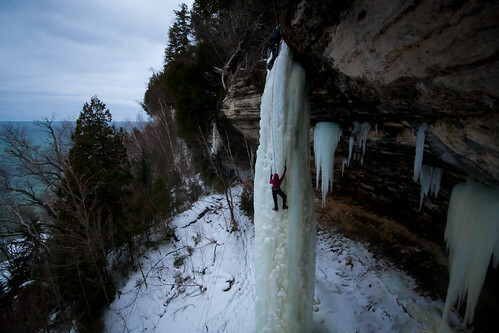 This entry was posted in Trips & Destinations and tagged ice climbing, michigan ice fest, munising. Bookmark the permalink. This is very fascinating post. I actually preferred it. i thought this was a very great submit to read. i’ll verify back for brand new posts by you!